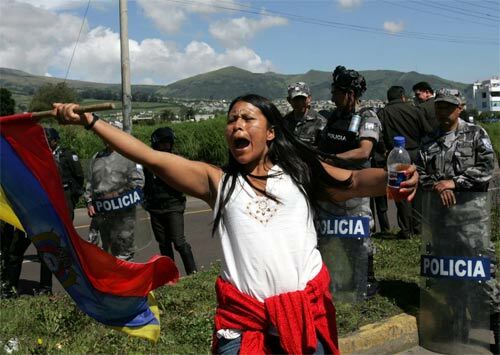 An indigenous Kichua woman shouts in front of police officers during a march from the Amazonian region to Quito in Cutuglagua, south of Quito, Monday, March 20, 2006. They want to talk with President Alfredo Palacio concerning the Free trade agreement with the United States. Source: AP Photo/Dolores Ochoa R.